The fourth letter in the Hebrew alphabet is dalet (or daleth). There is some disagreement over the original meaning and shape of the letter. As we can see from here, the shape either represented a door or a fish. The connection to door seems clear - the Hebrew word for door is דלת - delet. But to some the original shape did not seem door-like, and looked more like a fish. Therefore some claim that the original name of the letter was dag דג (or digg in Phoenician) - meaning "fish". Why did the letter change its name? David Sacks writes in Letter Perfect that this was possibly part of the switching of a number of letter names. He claims that around 1600 BCE, the letter became dalet when the "N" letter switched from nahash (snake) to nun (fish). This was to avoid the confusion of having two letters both with "fish" names. (The "N" letter became "nun", according to Sacks, to bring it in line with the letter mem, meaning water. This would be easier for children learning the alphabet - "water" followed by "fish." What of the origin of the word delet? Kutscher writes that delet is one of the few words in Hebrew with a two consonant root - the tav is not radical (שורשי in Hebrew, derived from the Latin word radix, which means "root"). His proof of this is the the word for doors in Akkadian is dalati - and ati is a suffix for plurals. We also see in Hebrew that dal דל can mean door - עַל-דַּל שְׂפָתָי (Tehillim 141:3). Klein, Stahl and Steinberg all connect delet to דל, and particularly to the two verbal roots: דלה and דלל. How are they all related? At first דלה and דלל would seem to be opposites. The root דלל means "to be low" and also means "to become poor (דל), to decrease, to dwindle, to dilute (unrelated etymology), to thin out". On the other hand דלה means "to raise up" - as in אֲרוֹמִמְךָ השם, כִּי דִלִּיתָנִי - "I extol (lit. lift up) you, O God, for you have raised me up" (Tehillim 30:2). The seeming contradiction can be resolved by looking at the original context of the imagery. The verb דלה originally meant to draw up water from a well - the Hebrew word for bucket is dli דלי. In other words - what goes down must come up (or as I once heard someone say: "I'm afraid of low heights, not high heights. If I ever fall off something high, as I approach the bottom, I'll wish I was back up high again." On this basis, both Steinberg and Jastrow say that the meaning of דל is "to be suspended, swing". This is its meaning in Aramaic: בגדך מדלי - "do you depend (suspend yourself) on good luck?" (Yerushalmi Shabbat 15d). Stahl says that דלה is related to תלה - also meaning "to hang, to suspend." This can help us understand another meaning of the root. According to Klein, dala דלה - can mean "thrum" - warp threads hanging in the loom (See Yeshaya 38:12). 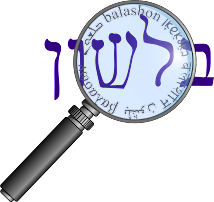 The letter dalet alternates with zayin - (נדר and נזר) as well as tet and tav (בדל בטל בתל).